On December 18, Financial Planning released a list of 18 people advisors should watch in 2018. 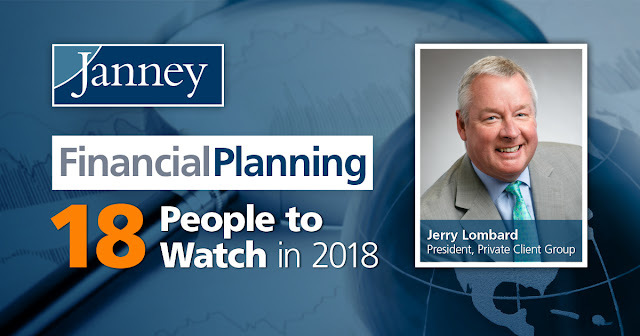 Janney’s Private Client Group (PCG) President, Jerry Lombard, was included in this prestigious list. Ranking in at number 11, Lombard was recognized for leading Janney during its impressive recruitment efforts in 2017. The Financial Planning article praised Lombard’s efforts in 2017, overseeing the recruitment of more than 65 Financial Advisors that manage over $5 billion in assets. Lombard has served as President of Janney’s PCG since 2004, and has been with the Firm since 1983. Events set to unfold in 2018 will remake the wealth management business. The fiduciary issue is still looming over the landscape, so the big regulators are prominent in our list of 18 people to watch. But industry players are making a difference, too. Big firms are pulling out of the Broker Protocol and prompting recruiting sprees, not to mention lawsuits, which could help reshape the industry for years to come. Meanwhile, new technology will continue to disrupt the industry, and M&A will remain a major story line as several war chests are being accumulated.